Large Popcorn, No Butter: Frozen: Yes. It is THAT Good. Frozen: Yes. It is THAT Good. For weeks I have been hearing my previous babysittees, fellow Disney enthusiasts, and award shows sing (sometimes literally) the praises of this film and I FINALLY found someone to go see it with me last week. The movie is set in Scandinavia, in a land called Arondelle, where two little princesses live with their royal parents. 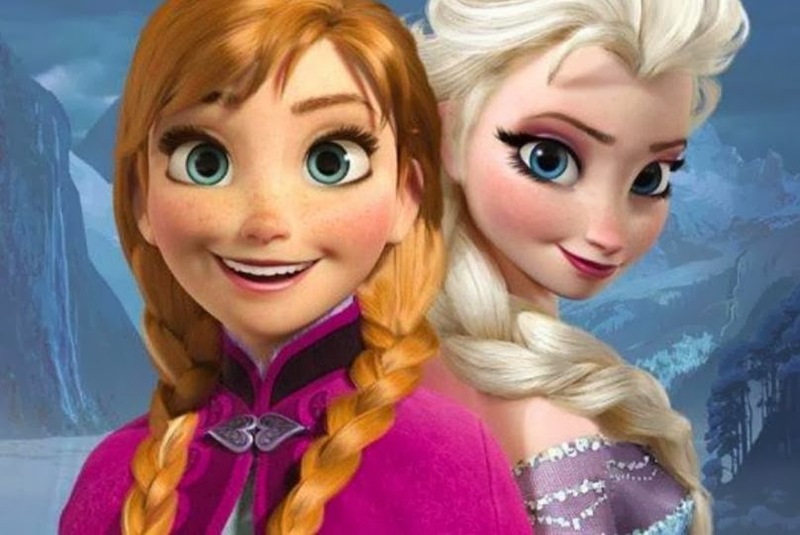 On a night where the younger of the two, Anna, can't sleep, she wakes up her older sister, Elsa, and tries to persuade her to build a snowman. As the two escape downstairs, Elsa reveals that she has magical powers that enable her to make snow and ice. Even though they are merely playing, Elsa accidentally hits Anna in the head with some of her magic. 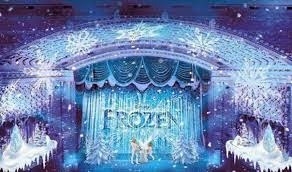 Although the crisis is quickly averted by the king and queen, they decide to hide the two girls away from the world, urging Elsa to conceal her powers. Anna has no memory of Elsa's special gift and so is confused by her sister's cold manner (see what I did there?) for years. Years later, when it is time for Elsa to step up as queen, she accidentally reveals her powers to her kingdom and, in turn, runs away from Arondelle to protect both herself and others. Anna then makes it her mission to find her, repair their broken relationship, and to persuade her to thaw the winter that Elsa unintentionally brought upon their town. 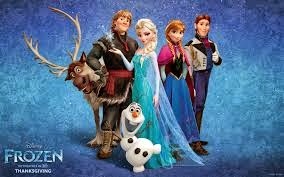 Along the way Anna makes friends with a prince named Hans, a guy named Kristoff, his reindeer Sven, and a talking snowman named Olaf. -MUSIC MUSIC MUSIC: there is a reason that this movie won some stuff at that awards show two weeks ago (one week ago? a week and a half ago?). All of the songs in the film harken back to the Golden Age of Disney animation back in the 90s, and for one spectacular reason: you can tell that they were thinking Broadway when they made this. In the same way that Beauty and the Beast, The Lion King, and The Little Mermaid all became smash-hits on Broadway, Disney seems to have anticipated its success and prepared for this musical ahead of time. Boasting Idina Menzel of Wicked and a surprisingly versatile Kristen Bell, all of the songs in this film are incredibly catchy. And not in that annoying "Call Me Maybe" kind of way. -Girl lessons: How many people are going feminist these days? Yep. Lots. And Disney doesn't seem to have taken this for granted. As a girl that wrote an embarrassingly long paper on a feminist reading of The Swan Princess, I've got to say that it's nice to see a movie that tells girls, "Hey. Sometimes finding true love is as easy as looking at your family tree. And not at prince that you've only known for, like, a day." It's also about rejecting traditional fantastical plot lines and introducing ones that are more realistic. After all, you wouldn't want your kids to grow up thinking that marrying a guy that has never heard you speak (The Little Mermaid), has only hung out with you once (Sleeping Beauty, Snow White, Cinderella), and/or needs to rescue you all the time (too many.) is commonplace. Girl power. Just like the Spice Girls always said. 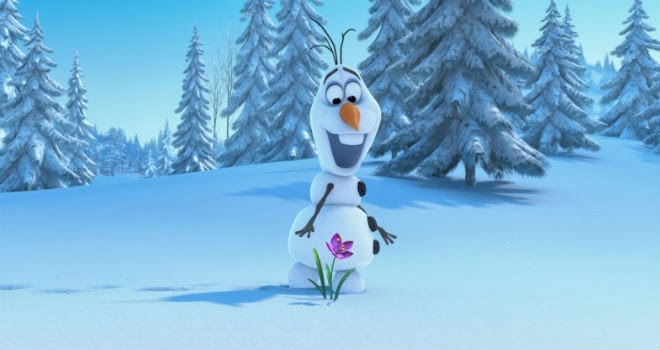 -Olaf the Talking Snowman: Such a huge part of kid movies' appeal is an entertaining cast. But where Disney frequently ups the ante is its inclusion of the adults that are so frequently watching these movies with their kids (or, y'know, weird 24-year-olds that really like cartoons...ahem...). When I first saw the preview for Frozen a few months ago I actually cringed. I was like "Crap. A great plot; sounds interesting; and they had to incorporate a stupid talking snowman. Great. Why not just call it Snowbuddies 12." Honestly...I have never been so wrong. Olaf is a key reason why I liked this movie. In fact, I would say the personalities of all of the characters in general are just ultra-relatable for a kids' movie. Their optimistic attitudes aren't the ditz-prince interactions that we're used to. These guys have substance. But are still hilarious. And I like that. In conclusion: go see Frozen. And embrace YouTubing all of the various songs in it, because they're going to become the new ones that you belt in your car. I'm gonna do something crazy and just show you guys this song, because all of the trailers aren't very good. Enjoy! Thank you life!!! I'm so happy to see everyone LOVING THIS MOVIE! I know! It's been a while since there was a good movie everyone could agree on, haha.